When our friends from Washington came to Oliver to visit us we knew we had to make their three day stay a memorable one. On the top of our list was a canoe trip to Vaseux Lake. The hardest part to a canoeing trip is all of the preparation it takes to get ready! The five children in our group were given the tasks of getting their bathing suits on and finding hats while the six adults in our group loaded up the canoes and kayaks, tied them onto trucks, found appropriate sized life jackets, made a picnic lunch, and basically gathered up everything else we needed. It may not seem like much but it took us the better part of the morning! Luckily we did not have to drive too far to get to our destination as Vaseux Lake is located only a ten minute drive south of Oliver on Hwy 97. There are a handful of places to pull over along the East side of the lake and we chose a spot just North of the Vaseux Lake Provincial Campground. 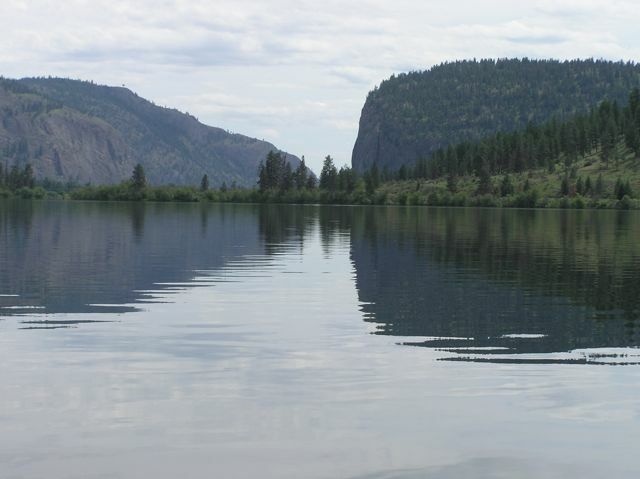 What we LOVE about Vaseux Lake is that motorized boats are prohibited. This makes canoeing so much more pleasant as you do not have to contend with fast going boats that make a lot of waves. On a calm day the tranquility of the lake is simply magical and we were lucky enough to have the entire lake to ourselves that day! We paddled North first and skirted around the Vaseux Lake Bird sanctuary. We saw plenty of geese and ducks and even a turtle! The lily pads were in blossom and we got close enough to touch them! Next we paddled across the Lake to the West side and then we headed South hugging the shoreline. We knew from a trip here last year that there is a very lovely and private beach on this side and we were in search of it for our picnic. Unfortunately the high water of spring had flooded the beach but we still managed to pull ashore and have a picnic in the tall grass. Those of us who were brave enough (me and the children!) had a quick dip in the lake. Although Vaseux Lake gets quite warm in the summer, the spring time water temperature is more of a get in and get out experience! With McIntyre Bluff in the background we made the round trip back to where we had left the vehicles. The calm waters reflected the mountains and sky back to us as we glided through the tranquil waters. Our out-of-town friends loved our canoeing trip on Vaseux Lake and we were so happy to share such a beautiful day on the lake with them.